Reclassification update from Capitol Hill: The good news is that our efforts are working! 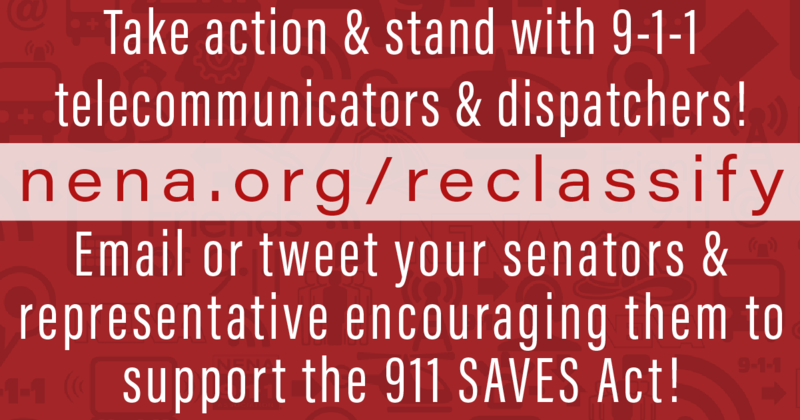 The 911 SAVES Act, which (if passed) will reclassify Public Safety Telecommunicators and dispatchers, now has 19 cosponsors in the House. Recently, Senators Burr and Klobuchar formally introduced a Senate Companion Bill. This is a huge step towards reclassification and a new opportunity to demonstrate your continued support that will get us over the goal line. The latest stats: Over the last few weeks, you've help send nearly 31,000 emails to elected officials and done nearly 1,000 Twitter posts. More than 11,000 of you have engaged with the NENA Online Action Center, and the numbers are growing daily. THANK YOU! * Review this fact sheet Fact Sheet from Rep. Torres’ office for an overview of the bill. * Even if you have already done so, visit NENA's Online Action Center to reach out directly to your local Members of Congress. This is especially important now that there is a Senate companion bill. NENA Facebook Page, and “like,” “retweet,” and “share" our posts. Or share your own story and photo on social media using the hashtag #911SavesAct. A sample image you can use to share your support and get others to do the same can be found below or downloaded here Sample Image. * Adopt a Resolution showing support for 911 SAVES and urging your elected officials to do the same, see this resolution template Resolution Template. And don’t forget, this isn’t just a NENA members issue! Please share this with your friends, family, and colleagues, and ask them to support us! Thank you for helping share our story and supporting this important legislation! We have an update that requires additional steps to support the 9-1-1 SAVES Act, which would appropriately reclassify public safety telecommunicators with other "Protective" occupations (as opposed to administrative/clerical occupations) in the Standard Occupational Classification. Recently, Senators Burr (R-NC) and Klobuchar (D-MN), co-chairs of the NextGen 9-1-1 Caucus, introduced the bill in the Senate. Now it's time for a full-court press on Congress. EVEN IF YOU ALREADY TOOK ACTION, WE NEED YOU TO TAKE ACTION AGAIN. Go to https://www.apcointl.org/take-action and fill out a form to generate an email to your U.S. Senators and Representatives, asking them to co-sponsor this common sense, zero-cost bill to reclassify public safety telecommunicators as Protective Service Occupations. Please share this link over social media and encourage your friends, family and colleagues to show their support by filling out the form. APCO will provide updates as they become available. For more information on the SOC and reclassification effort, visit apcointl.org/soc. As promised, form letters for the House and Senate are available.